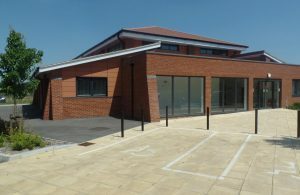 Bookings from residents and local community groups are being taken for the hire of Hailsham’s brand new community hall – the James West Community Centre – which is located off Brunel Drive in the north of the town and opened its doors to the public just a few months ago. The James West Centre, named after the founder and Chairman of the Hailsham & District Sports Alliance (now Hailsham Active) who passed away in November 2016, consists of an 18m x 11.7m hall, able to accommodate an audience of around 200 seated for public performances. The building also includes two meeting rooms (10 and 16-person capacity), a large kitchen, store rooms, toilets, changing rooms and a P.A. system. The facility can be hired for community events, sports, business meetings, memorial services, youth groups and other social events, as well as private function hire. The provision of a community hall and sports facility was made as part of the initial planning agreement between Wealden District Council and Welbury Farm developer, Taylor Wimpey. For further information about the James West Community Centre, or to make a booking, contact Hailsham Town Council on 01323 841702 or by email: enquiries@hailsham-tc.gov.uk.